Crystal Palace have signed Wales international striker Jermaine Easter from MK Dons for an undisclosed fee. The 28-year-old had joined Swansea City on loan until 31 January in November but his stint at the Liberty Stadium was ended by the Dons on Friday. Easter has agreed a two-and-a-half-year deal at Selhurst Park and could make his debut against Swansea on Saturday. 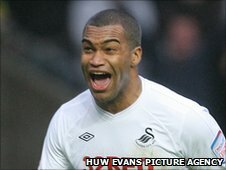 The eight-times capped former Wolves trainee made seven appearances for the Swans, scoring once. Cardiff-born Easter left Wolves for Hartlepool in 2001 and has also played for Cambridge, Boston, Stockport, Wycombe, Plymouth, Millwall and Colchester. His most prolific season was in 2009/10, when he scored 19 goals for MK Dons in all competitions. Easter said he hopes to help relegation threatened Palace move up the Championship table and out of danger. "It's a different pressure to at Swansea but it's about winning football matches wherever you are in the league," he told the club website. "It's a competitive league and I'm sure we've got enough to kick on. "What's important for me now is scoring the goals and getting another year in the Championship and then pushing on to where we want to be rather than looking over our shoulders." Easter joined Brendan Rodgers' Swansea after Marvin Emnes was recalled by Middlesbrough. "We have still got enough strikers but obviously Jermaine has come in and done well for us," said Rodgers. "But we have got other good strikers. We have got Stephen Dobbie and Craig Beattie. We have got Shefki [Kuqi] who is sitting outside the squad as well." One of Rodgers' strikeforce, Gorka Pintado, is at AEK Larnaca on loan for the rest of the season. The return of Easter to MK Dons came on the same day that the midfielder Jordi Lopez has had his contract at the Swans cancelled by mutual consent. The 29-year-old Spaniard was signed on a free transfer in July 2009 by former manager Paulo Sousa but struggled with injury and was out of favour.